Her efforts are not rewarded—she slips farther down the frozen monolith and dissolves into giggles. 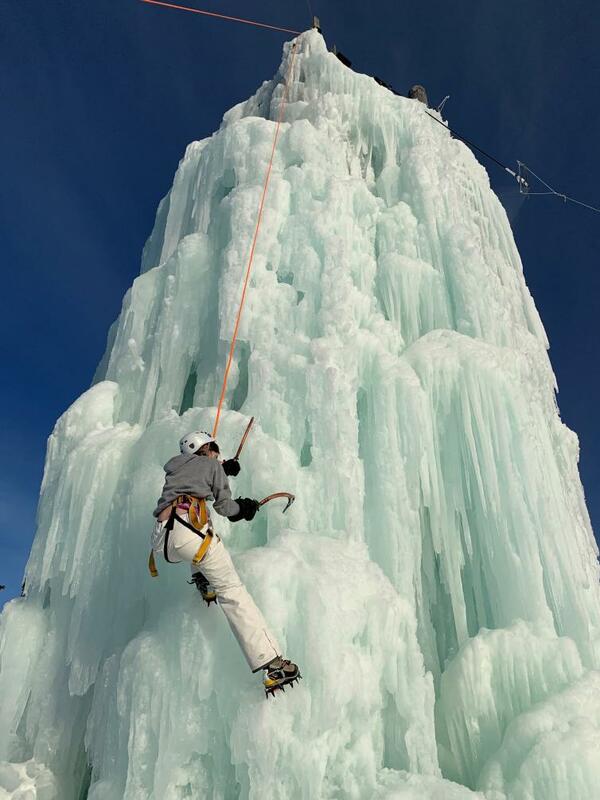 Scaling the 60-foot ice tower at Big White Ski Resort is no easy feat, even when kitted out with a helmet, harness, hiking boots sporting spiky crampons, and two ice axes that would terrify even Freddy Krueger. That tip makes all the difference. Ten minutes later, Avery has reached the top. She rings a bell to announce a successful ice climbing adventure while we cheer her accomplishment from the ground. Our family has driven up to Big White from Kelowna for some fun on a beautiful bluebird day. We started the morning on downhill skis. 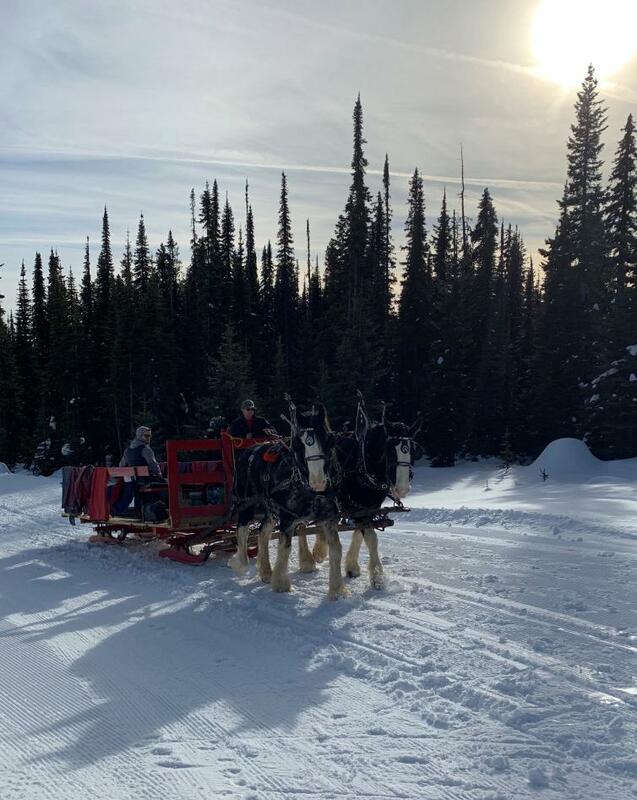 Our son, who has autism, joined a lesson with Powderhounds Adaptive Snow Sports, while our daughter and her friend spent a few hours zipping down groomers and the Ogopogo Trail, a tree run that zigzags through the forest like the serpentine lake monster for which it’s named. 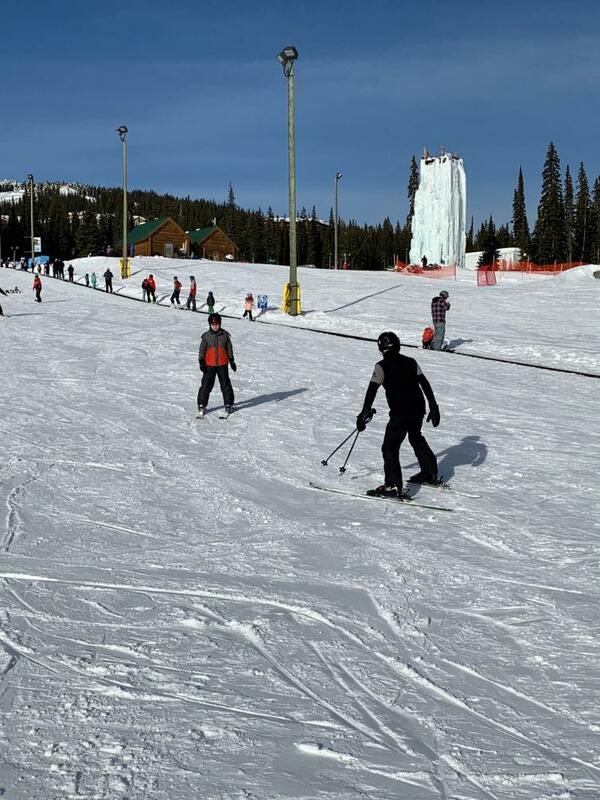 Without children to chaperone, my husband and I happily did laps off the Cliff chair on Big White’s backside. After a delicious lunch of lamb stew, burgers and fries at The Woods restaurant in the village centre—plus a few more afternoon runs—it was off to the Happy Valley Adventure Park at the base of the gondola for tubing at the five-lane tube park and a go at the intimidating ice tower for Avery. Big White is under an hour’s drive from the city, so it’s a quick trip up to the resort to access every snowy outdoor pursuit you can think of. If you need a lift to Big White you can take a shuttle with Cheers Okanagan and get picked up right from your hotel. Most people associate Biggie (as locals call it), with downhill skiing. While that’s what put it on people’s radar, the ski hill has established itself as an outdoor adventure Mecca. From the Happy Valley Adventure Park it’s possible for families to ice skate; go Nordic skiing, snowshoeing or fat biking on a network of cross-country trails; mush through the surrounding wonderland wilderness on a dog sled pulled by a team of huskies; nestle under blankets on a horse-drawn sleigh ride; or let children under 90 lbs. rev a Mini-Z snowmobile around a kids’ track while parents warm up by the community bonfire at the base of the tube park. 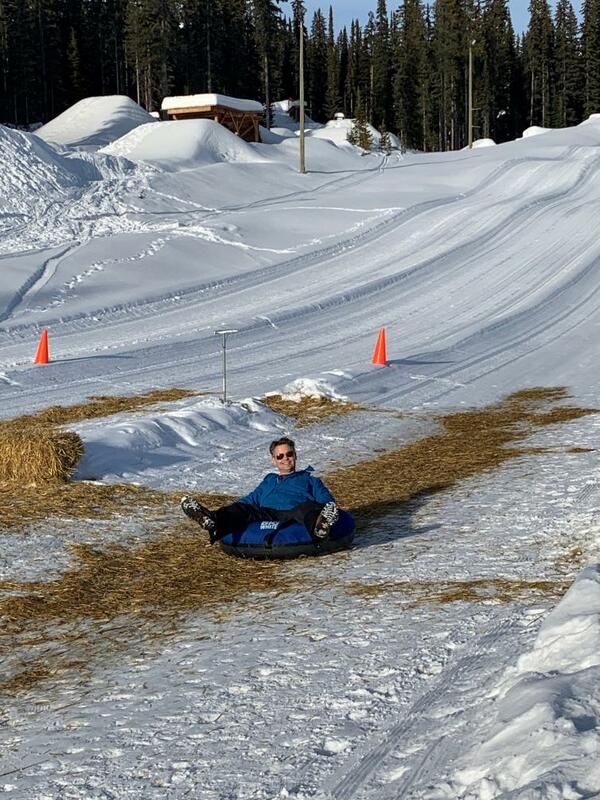 In fact, it’s easy to spend an entire day at the hill without ever riding a chairlift. What we love most, though, is the vibe and energy on the hill and in the family zone—kids, parents and even grandparents are outside having fun together. We joke around with the kids on chairlift rides, talk about our experiences over lunch, and laugh our heads off zooming down the tube tracks. Time spent together in nature is a perfect recipe for Family Day weekend. At day’s end, it’s a fast drive back to Kelowna, where more activities await (a definite perk—beyond the mild temperatures—to staying in the valley). In town, we love the free ice-skating at Stuart Park, with a great view of Okanagan Lake and the lights across the water. 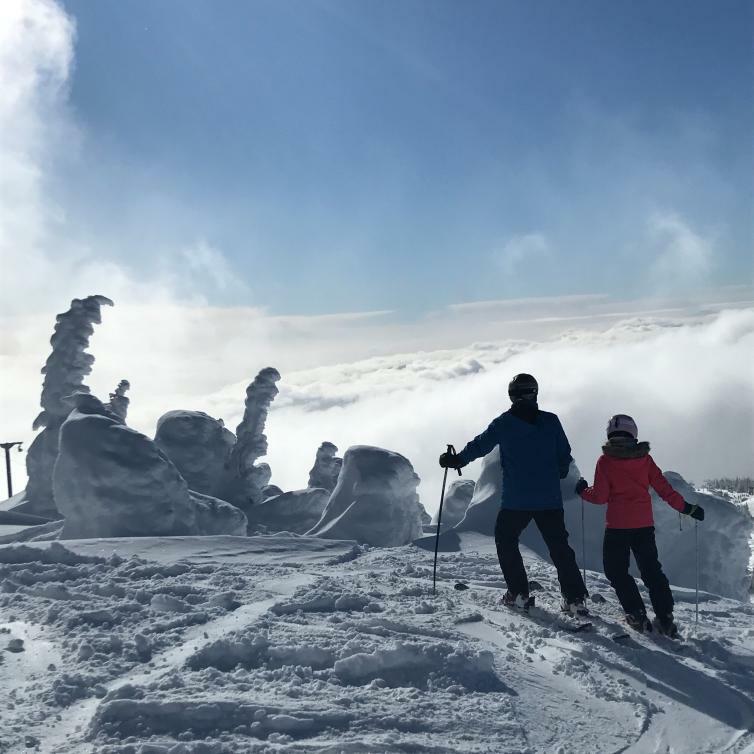 You can also catch a movie, go bowling at BNA Brewing or take in a WHL hockey game (the Kelowna Rockets skate on home ice on Fri., Feb. 15 and Sat., Feb. 16). 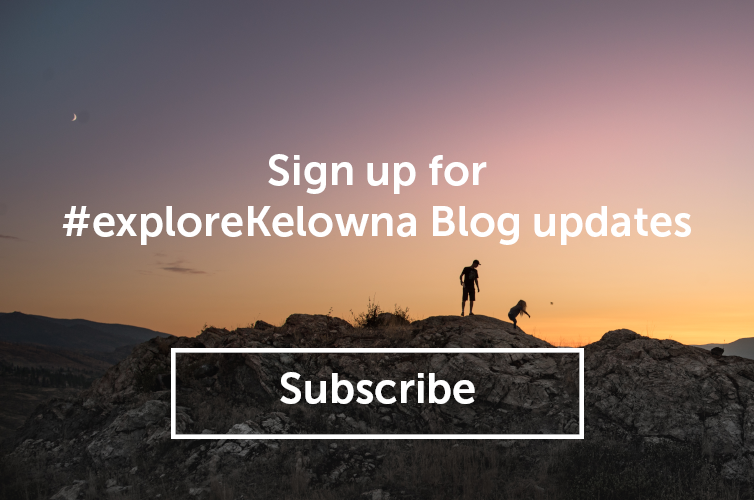 Bonus: since it’s difficult to get lodging on the hill during busy weekends, a number of hotels in Kelowna offer ski and stay packages. The next day you can repeat, or explore the trails and outdoor adventures closer to town.